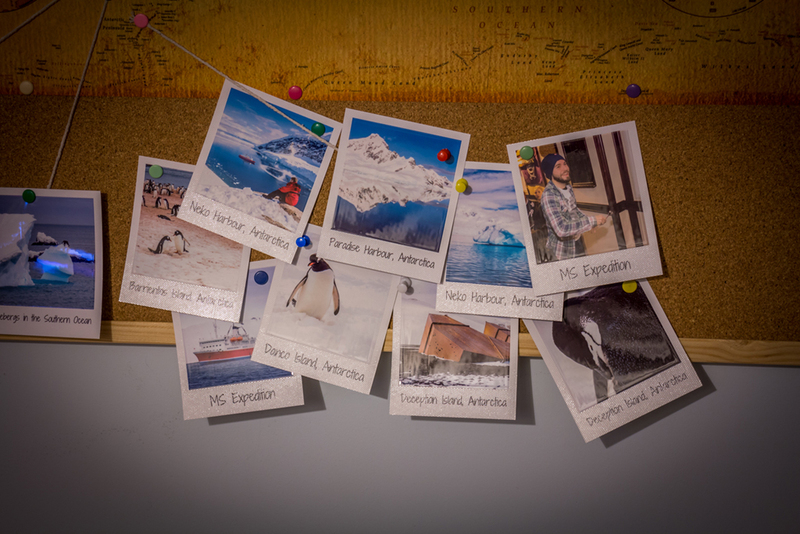 I love having mementos and lasting reminders from my travels - Something tangible I can look back on and have as a permanent record of the different places I have visited and wonderful things I have seen. 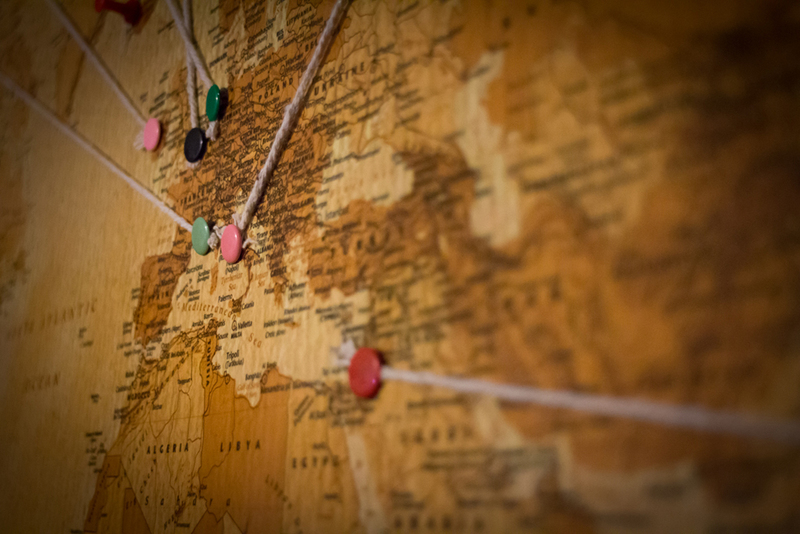 Together with my travel chest that I keep various keepsakes in, I brought a travel map and mounted it with photos I have taken; I love studying maps and looking at the different countries and regions of the world, whilst planning my next trip and remembering where I have already been. If you have a permanent residence and can spare a little money to do something like this I think it is definitely worth it! It's really easy to create and it's simply a case of finding the right map and board to suit you and using your imagination to create something fun. 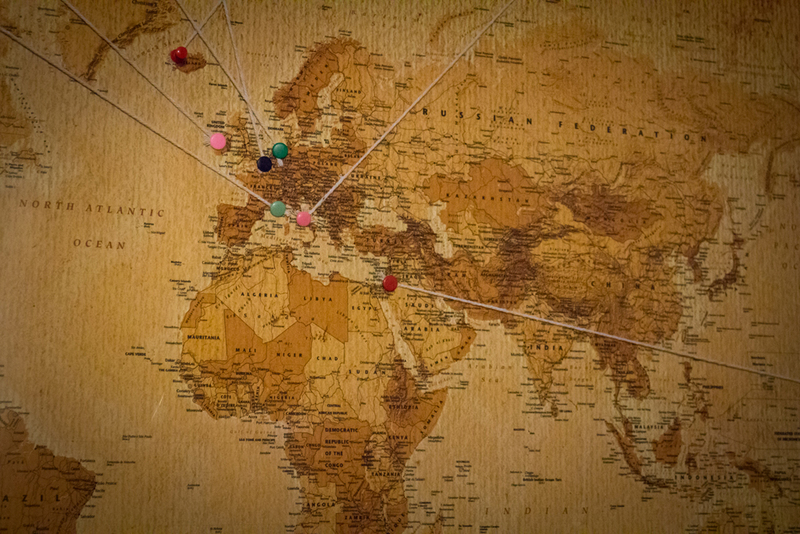 If you have a mounted travel map of your own I would love to see them so feel free to leave a comment and share your creation! 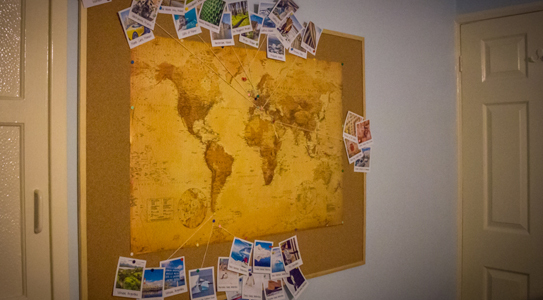 Cork Notice Board - You could just simply mount your travel map straight onto your wall, but then you would have no space for any photos, therefore I think a cork notice board works better. Notice boards are easy to find - either in stationary shops or on ebay. I brought mine on Ebay for £18. The board size I chose was 1200mm x 900mm (47" x 35" approx),and had a wooden frame. You can get various sizes and either wooden or aluminium frames - I chose wood for a more natural feel. 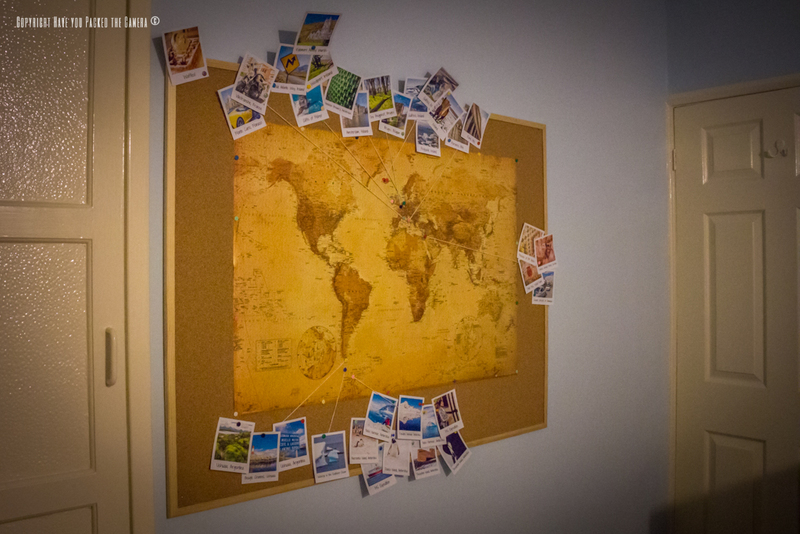 I chose 1200x900 to allow for enough space for the map and for the polaroid photos around the outside. 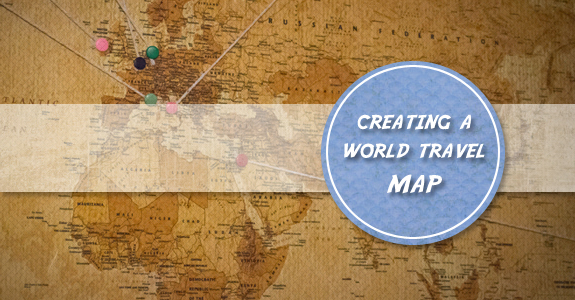 World Map - Fairly straight forward and the main component; a world map to mount on the notice board. The possibilities here are endless and there are so many different types, styles and colours, it really comes down to personal taste. 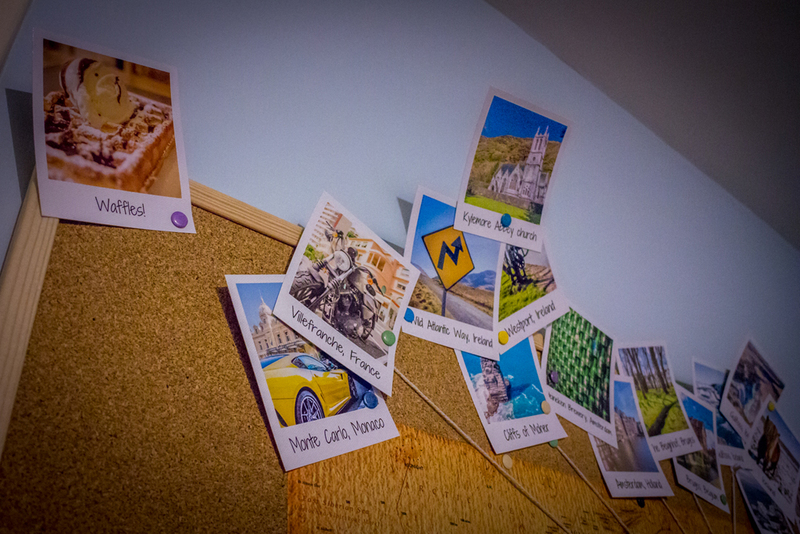 Ideally you want a poster that can be simply attached to the notice board using pins, but I guess you could use a canvas or a framed map too. I again found a map on ebay, for £5.99 (bargain! ), it was a good size and I liked the style (a more old fashioned looking design in a brown parchment colour like old pirate maps haha). 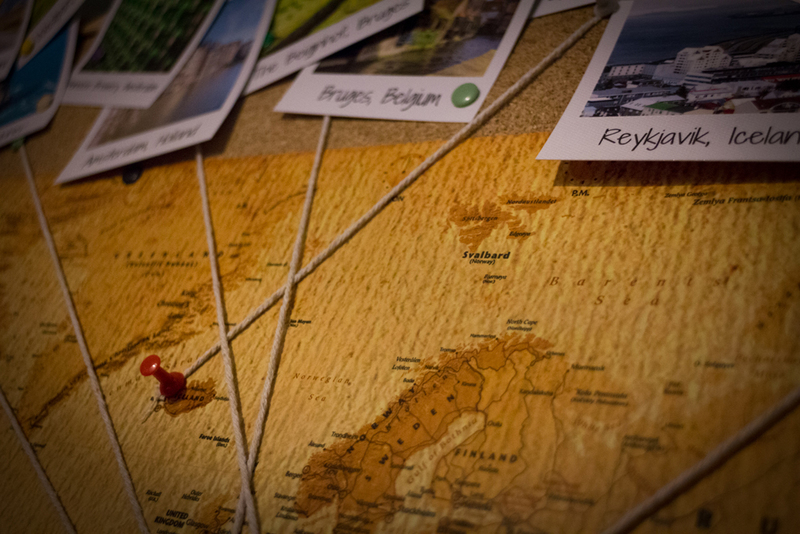 Travel Photos - The idea behind this travel map was to have a world map bursting with various photos from my travels so I wanted small prints that would fit around the map. I came across the company photobox who print a wide variety of photos including old polaroid style photos - These were perfect so I ordered 36 prints for £18.99 to start with. The prints are exceptional quality; the materials feel really high grade, and the colours and sharpness of the print look so vivid and clear - I know the price isn't the cheapest but for something like this that is a one off, I would recommend using photobox. Pins / String - Fairly straightforward, just some drawing pins to attatch your photos to the board, and some string to create lines coming from the photos, connecting them to the various points on the map they were taken. You can get these from any stationary shop for little expense. I think I got a ball of string for £1.49, and the board I brought came with some coloured drawing pins.